The cooperation with Tradewise Gibraltar Chess Festival continues and goes from strength to strength. 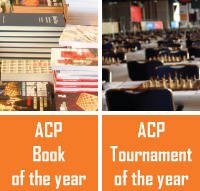 As usual, there will be several dozens of ACP Premium members participating in the tournament, and ACP introduces four special prizes - two for overall standings (2000 GBP and 1000 GBP), and two for the ladies (600 GBP and 400 GBP). These prizes will be awarded to the highest-placed ACP Premiums, who did not win a bigger regular prize in the tournament. In order to be eligible for the prizes, a player has to be the ACP Premium for the year 2018. Last, but not least, we'd like to thank the Archibald company, whose donation allowed us increase the prizes for our members.